I've finished the Lemoyne Star top. I can't tell you how pleased I am that this is done. The kit of cut fabrics have been sitting in my closet for about 5 years, maybe 6. I'll have it longarm quilted when I go home. Or maybe I'll do it myself. We'll see. The thing I love about this quilt are the four corners. Don't you love how they show really nice when laid out on a bed. Many thanks to Marsha McCloskey for a great pattern in her Quick Classic Quilts Book. 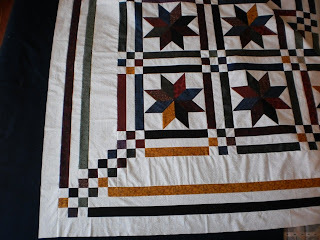 Even after all my whining about the 8 pointed stars, I'm sure I will make this quilt again. The stars weren't as bad as I thought they were going to be. A few weeks ago, I was whining about piecing together 16 Lemoyne star blocks. I have had this quilt kit for at least 5 years and I've been dragging it around with me to do, all that time. Well, I did get the blocks done a few weeks ago and I was quite pleased with myself. The 8-pointed stars were the hard part and now, the rest of the quilt would be a breeze to sew. I intended to finish the quilt when I got back home in mid April. It will be an easy finish. Earlier this week, I was looking for something easy to sew now that my Batik beauty is all pieced. I thought I'd put together the sashes and 9-patches for the Lemoyne star quilt and that way, it would be that much more done and really easy to put the quilt together when we get home. So I picked away at these sewing in 15 or 20 minute chunks. They took a few days but I did them with ease and almost effortless. I packed it all away in the pizza project box and tied a string around it. Done..until we get home. I guess, I knew that once I have this much done, I may as well continue. So this morning, I re-opened the box and in a couple of 25 or 20 minute sessions, the center of the Lemoyne quilt was together. I love how easy this format goes together. Because I always press to the dark, the seams lock together making the intersections perfect. I've come to the conclusion that this will not go back in the pizza box. A look at the rainy weather forecast for tomorrow and Monday leads me to believe that I'll have the three borders on in the next few days. The border corners are what I love most about this quilt. Stay tuned. I'll show you it in a couple of days. We take our morning walks to stay healthy and to admire the nature of the beach. Click on the photo for a better view.. I wonder if the dolphins have a routine. We seem to only spot them at certain times of the day. Today it's low tide and lots of dolphins everywhere. We've seen them playing near the shore quite a bit lately. It's hard to photograph them when they're jumping. My shutter finger is about an eigth of a second delayed. And my new little Caymens Camera doesn't have a viewfinder on it and I can't see the display outside, so I click and hope I get something. This is the best picture of our dolphin friends today. Can you see his fin? Here's wishing the Friday girls a fun coffee break. A couple more weeks, and I'll be re-joining you. Every morning, we get up to look out at the ocean. 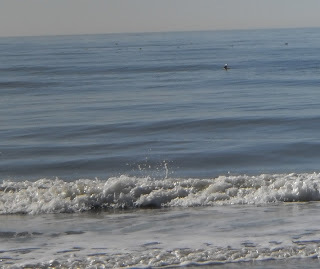 Mainly looking for our dolphins that up and down the shore looking for the little fish. Spring break is here, and there's usually a few people on the beach walking when we get up. But this day, we had some other guests. Look in the pool. Three ducks have make themselves comfy in the pool. They are swimming towards the stairs to walk out of the pool. They will hand around the stairs all day. They only stayed the day. I guess there's not much to eat in the pool so they probably left looking for a more fruitful pond to swim in. My Batik Beauty Table Topper is done. I can tell you that I spent way more time preparing to sew this than the actual sewing time. It was so quick. The paper piecing took the longest to sew, but I can tell you that ripping off the paper took twice as long. I'm serious. I know exactly how long it took because I ripped and picked it off while I watched a couple of movies. Next time I make a beauty, I've got to find a way to print the paper piecing part of the pattern on the thinner scrap pad paper that Karen recommends from the dollar store. I don't know if that thin paper will run through a photocopier. I'm very pleased with the black background. Doesn't it show off the beautiful batik fabrics. My next decision is what do I bind it with. I must go look at Karen's beauties for suggestions. I haven't decided if I will machine quilt it here or wait until I get home. Depends on the weather. It can't be a year since I showed you pictures of last year's milestone anniversary. But yes, another year has past. Today is our 26th Wedding Anniversary. If I had a scanner, I'd scan our wedding photo to show you that we haven't changed a bit!! Well, maybe just a little. I love our anniversary. Not that we need an excuse to reflect on how lucky we are to have each other, our health and our families. It looks like we will go out for a nice supper and maybe take in a movie. I was delighted to get letter mail from Baby Aurora today. She's starting to learn about stickers and shapes and she's getting pretty good about using many colors when she draws pictures. She is getting to an age where she will like to do crafts. She is coming to visit me as soon as we get home in 3 weeks. We'll have fun doing some projects, or at least I'll have fun. Today has us going on a little road trip. We'll be visiting Southport, North Carolina where my favorite stitching shop is. I'll look for a few perfect threads/ribbons for my CQ socks. Then we take a little ferry and head on to Wilmington, NC We're on a search for a Zhu Zhu Hampster ball for Grace. We can't find one anywhere here in South Carolina. 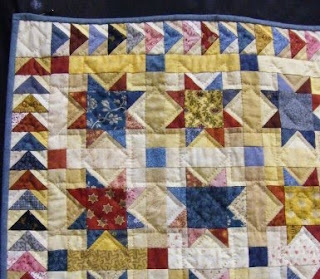 Something I didn't know, was that National Quilting Day in the USA is today. I'm not sure if it's the first day of spring every year, or March 20th every year. Either way, I thought I'd show you some of the things I bought recently to help me in my sewing and quilting projects. 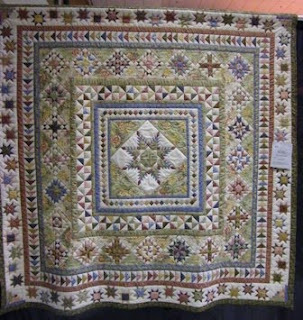 I've had my eye on this Quilt Halo for a while now. I don't have anything with me to machine quilt right now, but on the next rainy day, I may put a test sandwich of fabric together just to try it out. My hemming blue jeans tutorial is my most popular tutorial. One of the comments on this post let me know that there was such a thing as blue jeans thread. Who knew!! So now I have a spool. I'm going to fill a bobbin with this thread and keep it just for hemming jeans. I've been buying buttons for my crazy quilting. Because I'm working on three Christmas Stockings in the creams and whites, I've had fun buying buttons for my stash. Sew in honor of the USA's National Quilt Day, I will continue to sew a little on my Batik Beauty project, even though it's warm and sunny out and the blue Carolina skies are calling me. What are you doing on this National Quilting Day? How much entertainment can $2.00 give? At the Melbourne Quilt show last week, there was a used book and magazine table. They had boxes and boxes of older quilt magazines that were donated by their members. The girls behind the table said they had sold over half of the used magazines already. They were selling them 5 for $1.00. What a steel. I picked up 10 of the McCall's Quilting magazines. I really like that magazine but I've never subscribed to that magazine. That's a lot of entertainment that I'll get out of that $2.00. Money well spent as far as I'm concerned. 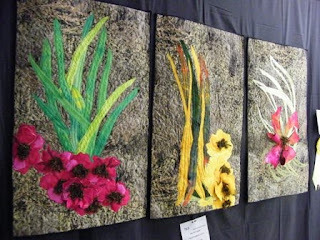 Here is my final post on the Melbourne, Florida quilt show that was held on March 12 and 13, 2010. There were so many nice quilts, and I do find it hard to take great pictures at a show because of the amount of people there. Loved this triptik. The grayish background was heavily textured. A very nice effect to show off the vivid colors of the flowers and leaves. The black draping also helped to make these show up beautifully. I can't say that I have a lot of pastels in my stash, but this quilt was so soft and gentle. Doesn't it remind you of Spring, and Easter. I might have to start looking for pastels to add to my stash. Loved it. There's noting like a love a good old fashion scrappy quilt. Isn't this eye catching. Just look at those stars and geese. I think that the connecting blocks in the sash really help to make the stars pop. 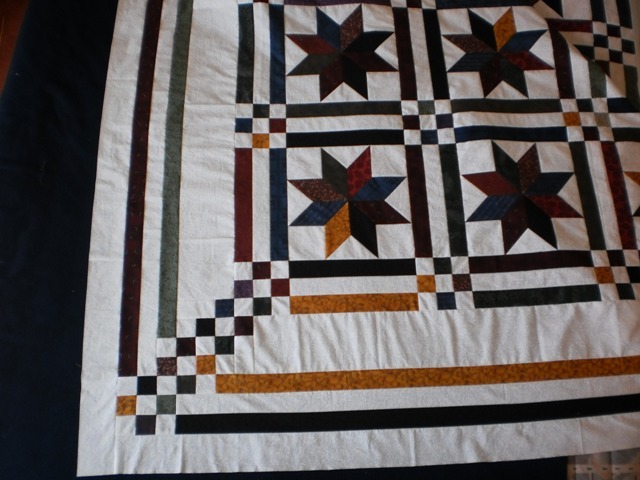 Of course the hand quilted outlining of the stars helped them pop too. I enjoyed this quilt on many levels. This next quilt is called Bears and Berries. The name is so cute. The bears is because it is the bear paw blocks. It's the berries that are unique on this quilt. In the closeup, you can see that the vines and berries are hand embroidered in different colors. The vines are outlined in hand quilting and that really accentuates them. I really like the hand picked look. I must ask my friend Linda H. if she knows how to do this stitch. I'd like to do some of these wheels on my current CQ projects. Again, this quilt made me smile and instantly made my favorites list. Remember the other day, I showed you my favorite mini quilts. I thought the same quilt maker made 2 quilts. I was wrong. This quilt was made by a different quilter. It sounds like Caryl Brayer Fallert was in the area and gave a class. 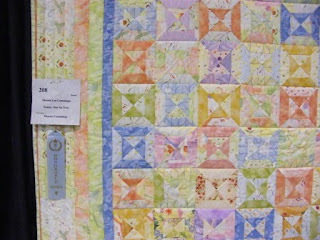 Both the mini and this quilt were made after both these quilt makers took her class. I enjoyed these quits, and even though they were in different rooms of the exhibition hall, it was easy to see that these were related. I guess they could be called cousin quilts. Since my hubby was with me at the quilt show, I asked him to give me his viewers choice pick. He took some time to look over all the quilts. When he came back to me, there was no question in his mind, that this was his favorite. He appreciated all the piecing and the overall look of this quilt. Does this quilt look familiar. 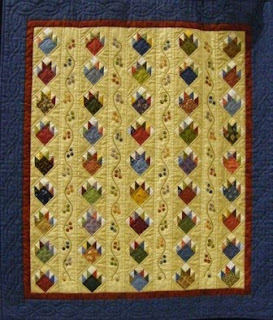 It reminds me of the block of the month quilt last year on "The Quilt Show" website. 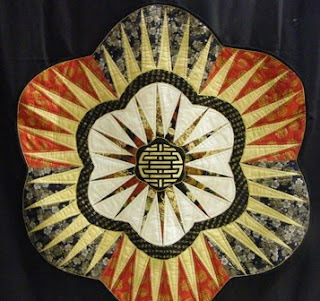 I have to agree with my hubby, this certainly is a stunning quilt. Well, that's the end of my quilt show picks. Thanks so much for a really great quilt show Melbourne. I loved visiting your great city. Well, it seams that I am drawn to water. We love to spend time at the lake in the summer. Our snowbird accommodations preference is right on the oceans edge. Our vacations lately all seem to have some cruising or water component. So I guess it's natural that I'm drawn to the quilts that are done using that old traditional favorite, Storm at Sea. These three Storms caught my eye. This first one is a full size quilt . I was standing looking at it with another quilter, and she kept saying, "It's making me dizzy". 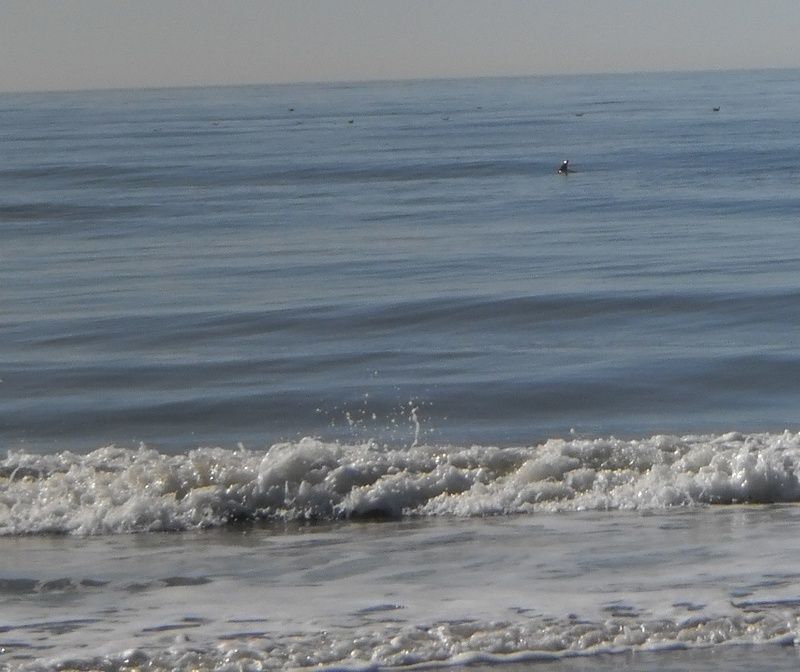 There was so much movement in the waves, that is hard to capture in a picture. It was beautiful. These two smaller storms had interest because the maker used different fabric for some strategically placed diamonds to give focus to a different shape. I loved this subtle red heart. 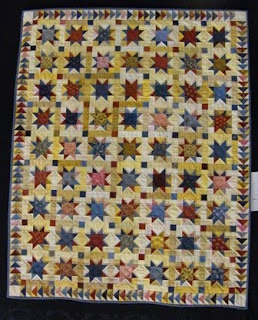 The bold intentional heart and two stars are so prominent on this quilt. This left me wondering if there were two very special people in this quilt maker's mind when she made this. The writeup didn't say. I enjoyed the blue and greys that is coloring this storm. A Storm at Sea is definitely going on my to-do list. Maybe it will be the kit that I bring with me next year as we snowbird along the ocean. Watch tomorrow as I show you more favorites. Last Saturday, I visited the Melbourne Quilt show. Melbourne is 15 or 20 miles south of Cape Canaveral. There were hundreds of people at the show. I'm so glad I went. I'll take a couple of days to show you some quilts that were personal favorites of mine. Today I'll show you my favorite mini quits first because my friend at home, Linda H. is working on a mini and she promised to show it on her blog soon. This first churn dash mini was exquisite. It is about 18" wide by 24" tall. The piecing was perfect, but what I loved most about this was the machine quilting and the binding. 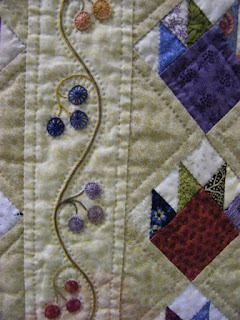 The quilting is whimsical and surprising to see the the swirls and bubbles in the quilting. I am a binding lover and I love how the maker of this quilt did an uneven curved binding. It really made me smile. I sorry I didn't get the name of the maker of this quilt. This next mini was slightly bigger than the churn dash above. 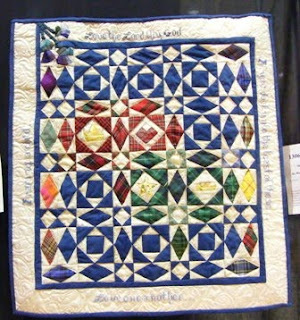 What struck me on this quilt was the colors, the traditional style, and how the Irish chain extends out to the corners. It reminds me of the layout of the Lemoyne star quilt that I'm working on now. But what is so different for this mini, is the embellishment of the borders. It's has the skinniest vines you ever saw. And they are embellished with 5 spoke silk ribbon roses. It also has beading to add a bit of sparkle. It is just sweet. This last mini was made by Kathy Gardze. This was made from a Caryl Brayer Fallert pattern in a workshop she took recently. This piece is so small. I'm glad I caught a bit of the label in the photo to show you just how small it is. There was another full size quilt just like this in the show. I will have to check my other camera to see if it was the same maker. I'm guessing it is. 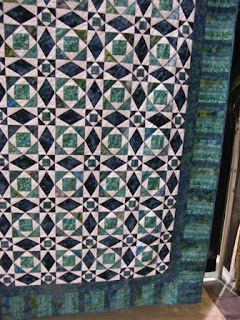 Watch tomorrow for another group of favorites from the Melbourne 2010 quilt show. We are back on solid ground from our cruise. We spent the day today at Kennedy Space center. We will be driving the final leg of our trip back to Myrtle Beach tomorrow. 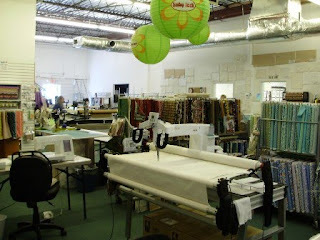 I have lots of stuff to blog about so I thought I'd show you a wonderful quilt store in Florida that I went to see. I decided to drop in to the Quilt Place for a couple of reasons. My guild friend, Sandy Mac said it was a mesmerizing store and that they had thousands of bolts of fabric. She was right! The second reason I went, was that they they carried the Sharon S. Quilt halo, and I wanted to buy one. The store is deceptive from the outside. The building is plain, but had a nice sign. But the minute you went into the store, you knew. I had to stop and just absorb the size of the store. The buzz and hubbub of a dozen workers, and dozens of quilters. It was half an hour until closing time. So I quickly made sure to get the things on my list, then I took the rest of the time to just browse and look. They had every book that I ever looked at online. Patterns too. 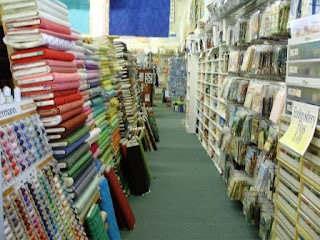 This picture is just one of about 10 aisles of fabric. There is no fabric out of season in this store. They had bolts and bolts of fresh Halloween fabric. Christmas fabric too. Kits, kits and more kits. Lots of samples. Threads.. lots of threads. I was surprised that they carried the brad of thread that I use for machine embroidery - Marathon. They had the large cones. They had 3 longarms set up. One was stitching by itself. And two others were being operated by one lady. One looked like it was a sample machine, that prospective buyers could play on. the other had a real quilt loaded and it was being panto'd. 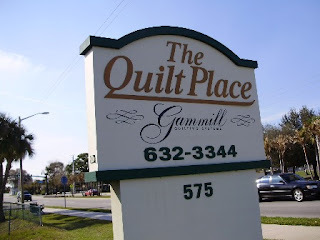 This is a wonderful one-stop quilt shop and I recommend if any quilters are in the Rockledge, Florida area, that you drop in, and leave yourself lots of time to browse books and patterns. Don't go without a list because you will quickly become overwhelmed. Is any of your money here? While walking around George Town in the Caymen Islands, it all looks quite familiar. We are in Cozumel today. Windy conditions prevented us from docking in the Honduras yesterday. So an extra sea day for us. We are in the Princess Cays the day after tomorrow and our clamshell is all ordered up. Too much sun is not a good thing. Ask how we know!! We are browsing the streets of George Town which is the main city in the Cayman Islands. It is a very beautiful and nice place to visit. Actually I could live here. It's so relaxing. It's a self picture on my new little camera. With all the hububb at the Fort Lauderdale cruise port, I thought Grampie had the camera case with my 2 cameras. And he thought I had it. No cameras. Well, it turns out that neither of us had it so guess what our big purchase in the Cayman Islands is. This is the Crown Princess. It's a lovely ship that holds 3000 passengers. 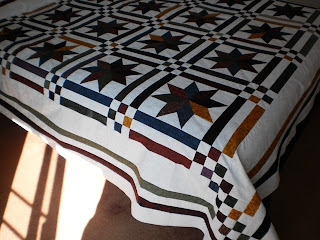 Last Friday, I was whining about all the Y seams in these Lemoyne Star blocks. In my post I had struggled to put one block together. With a bit of encouragement, some studying of different techniques on "Y" seams, re-reading my pattern, I was all set to tackle the job. So, this week, I'm pleased to say that I have all 16 blocks done. And I'm glad they are done. Again, the hardest part was just starting. I' m quite pleased with how the points meet on the centers of the stars. I never ripped out one seam. Pinning and managing that center seam is the key. The rest of the quilt will be easy to put together, and I'll do that back in Freddy Beach, where I can stretch out in my own sewing room. I've put away my sewing projects and today we are heading to Florida for a week to do some touristy stuff and to attend a quilt show. 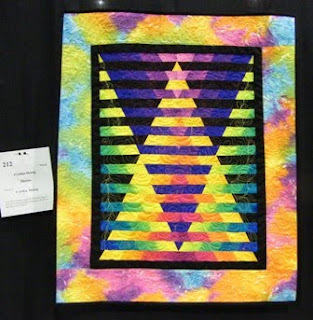 I'll be off-line for a bit, but when I come back in a week, I'll be sure to show you my picks at the quilt show and tell you about the big quilt shop that I'm going to visit. Stay tuned! Happy Friday to my very best Friday Girlfriends!! Talk about alliteration. I got stumped on what background I was going to use behind the paper pieced points on my Batik Beauty. So I went to the local quilt shop to audition various backgrounds. I fully intended to get a light background, but I came away with this beautiful and rich almost black background. I'm all set to stitch this beauty together when I get back in 2 weeks. I'm pleased with my progress on the 3 Christmas socks. Last week I intended to do more stitching while watching all the Olympics, but it was too stressful. I did some stitching this week and I pleased that 95% of the seams have at least one line of stitching on them. I started adding some lazy daisy stitches and some french knots here and there. I ordered some mini buttons and I can't wait to get them. I hope they will make nice flower heads to go on some lines of stems that are headless right now. Stitching on a monochromatic palate is slick. I load up 4 needles with different threads and stitch until I'm done. I now load my needles with threads so that it's easy to sit and stitch when I have a few minutes. When I don't have enough thread to do a full line of stitching, I use up shorter pieces of threads and make a feather stitch bouquet. I'll not be stitching in the next 10 days because I'm going away. So no stitch update next Wednesday, but there will be one the Wednesday after that.